The diversity in materials offered within this range means the Doble table is the most adaptable to personal preferences of all tables in the Cima Collection. The table tops are available in Belgian bluestone, teak, or matt coloured toughened glass. The Doble tables are ideal for both modern and more traditional surroundings, due to the timeless simplicity of the architectural design and when accompanied by either a Sillon or Butaque Lounge dining chair or Doble Bench, are an excellent contemporary dining solution. The Doble table is also available in the size 240 and 270. 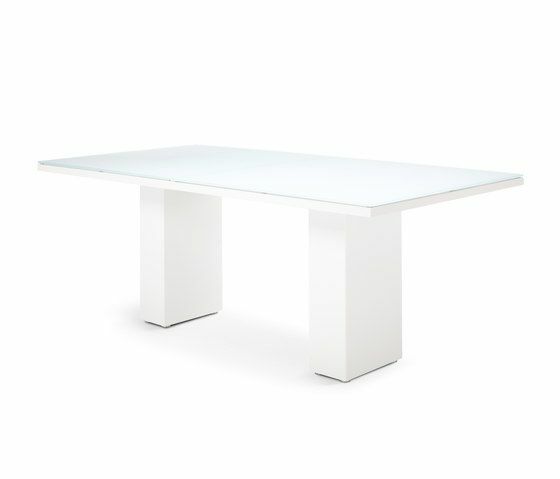 Designed by Dutch designer Hendrik Steenbakkers, these tables are built to a very high quality from the highest quality materials. Attention to detail in the design and production of the Cima range is outstanding; the adjustable stainless steel feet of the Doble table, and the etched FueraDentro logo on steel legs, are subtle yet highly attractive features in themselves. High grade stainless steel table base is also available in an electro-polished version.